Canada had a strong showing on Sunday, the first day of the Road World Championships in Ponferrada, Spain, for the Team Time Trial competition. Karol-Ann Canuel was a member of the winning Specialized-lululemon women's team, which took it's third consecutive title, while Svein Tuft anchored the Orica GreenEDGE men's team which took silver. 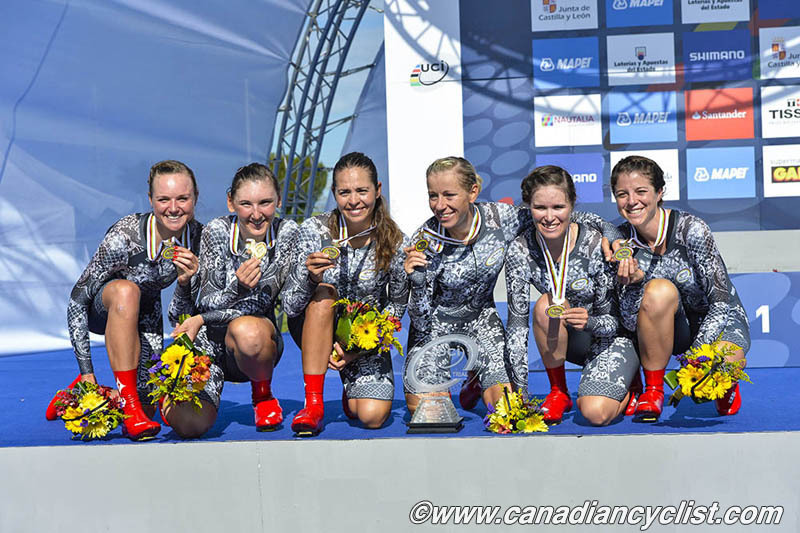 Canadians were also on the fourth placed women's team (Optum with Leah Kirchmann and Annie Ewart) and the 11th placed women's squad (Anika Todd with TIBCO to the Top). The women covered 36.15 kilometres on a mostly flat course with many technical turns and fast final descent into the last kilometre. Optum set the early fast time, which was only beaten by the three medal winning teams. Astana was the first to bump Optum off the Hot Seat, then Orica GreenEDGE and finally the defending champion Specialized-lululemon team. The race was marred by a terrible crash at the final roundabout, when Rabo Liv rider Anna van der Breggen crashed into the barriers. Marianne Vos had already dropped off the pace, but the team was in the hunt for a medal. 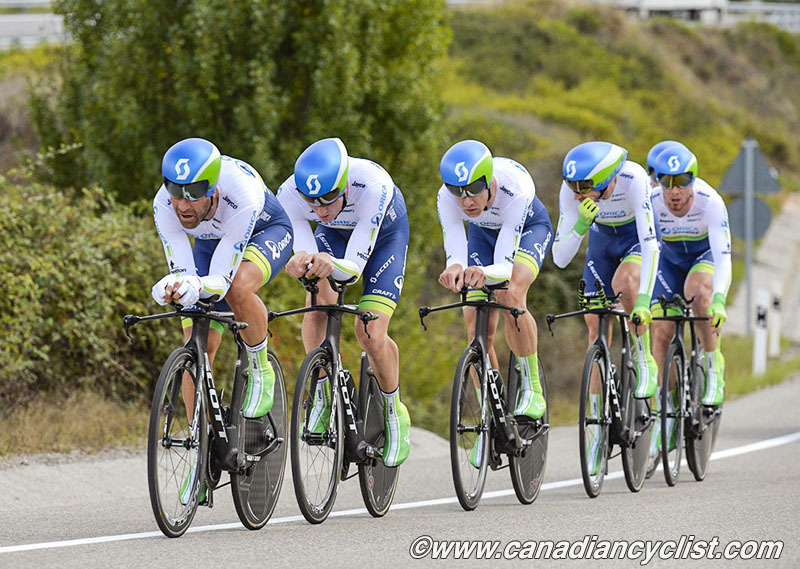 While they were given a time, the riders rolled across the line in shock. van der Breggen is out with a broken hip, while at least one other rider is a doubtful starter for the Netherlands later in the week. Anika Todd also had a difficult race, suffering a broken derailleur cable ten minutes before the team start. She was on the start ramp with 20 seconds to go, on her road bike, when the time trial bike showed up. She rushed down the ramp, swapped bikes and got back to the start gate as the final five second countdown was underway. Miraculously, she was able to stay with the team, however, had no front derailleur, so had to ride the entire race in her small chainring. The men's race was expected to be a repeat of the battle last year, when Omega Pharma - Quick-Step beat Orica GreenEDGE by a minuscule 0.8 seconds. However, it was BMC that proved to be the team to beat, notching up the fastest time throughout the 57.12 kilometre race, and becoming the only team to finish below one hour and four minutes. 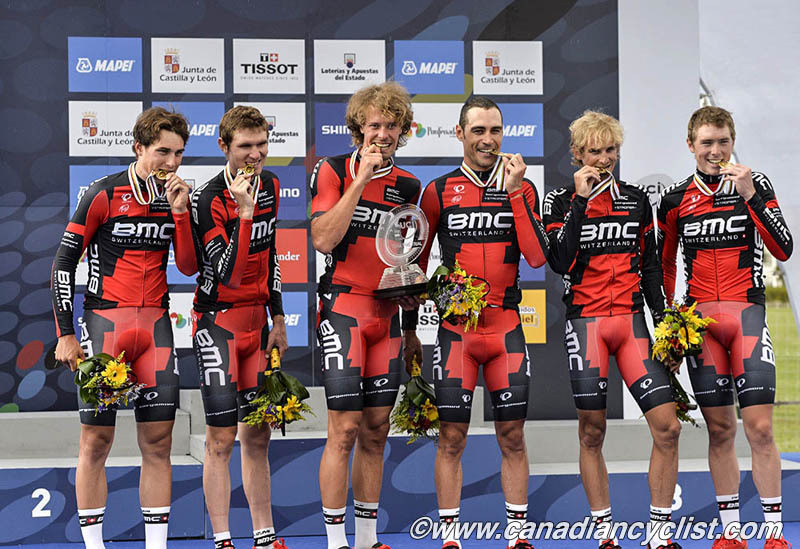 BMC's winning margin over Orica GreenEDGE was an impressive 31.84 seconds. BMC rode earlier than the favourites, who faced some rain and gusty wind in the final ten kilometres, but the time difference was large enough that the weather clearly wouldn't have affected the final standings. Team Sky looked to come closest to BMC but started shedding riders early and slowed by the final split to end up fourth. Omega Pharma also started fast before slowing markedly over the final climb to take bronze, while Orica GreenEDGE were sitting in fourth for most of the race until the final climb and descent, when they jumped to second. "We suffered out there," Tuft said. "Second again is not our favourite thing, but we gave everything we had that's for sure. It was definitely a lot tougher than we thought pre-riding the course. The last 10 to 15 kilometres was just a boxing match and it was really hard coming home."